These square wooden collars know as checks (pokes) were put on sheep or lambs to prevent them from going through holes in fences. Made of four pieces of wood in a square two of which can be removed to place the check around the animals neck. Wooden restraint or check put round a sheep's neck to prevent it from going through holes in a fence. Home made twitch or nose twister for a horse. Made of a cut off handle with a loop of rope put through a hole in the bottom. Used to calm horses. The loop was placed around the horse's nose and twisted. Solid poke for a cow or oxen. Bent wood arch with rod sticking out of the front. The animal can graze but can't get through a fence. A wooden horse poke to prevent a horse from getting through a fence. The leather strap goes round the horse's neck. The bar in the front is hinged to allow the horse to graze. Medium sized poke for a young animal. Chain collar for keeping a cow in a stall. Attached to wall by end. Locked by a loop through chain link. Metal loop with open end and tightening bolt through middle for putting in a bull's nose. One would attach a chain to the ring. An Iron chain and hooks on ends to prevent cow from kicking when she is being milked. Wooden stanchion suspended by a chain. Oblong shaped cowbell with a round gong suspended inside. This would have been place in a collar around a cow's neck so one could find out where the cow was. A metal bar is mounted on the wall with two chains with collars for holding livestock. This leather collar was placed around a cow's neck and attached to a post by a metal chain. Metal stanchion used for restraining a cow suspended by a chain. 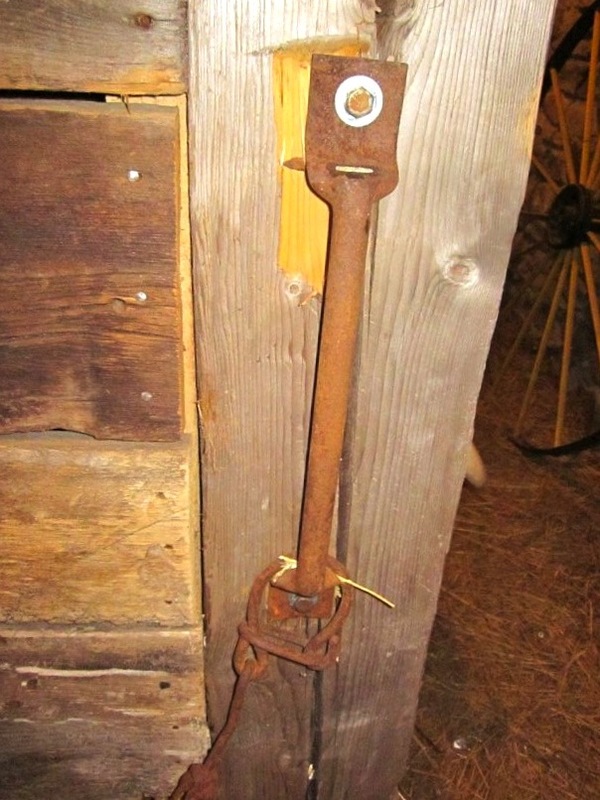 Cows could be restrained when they were in the barn by using wooden stanchions. This is a three part stanchion. There are many ways of restraining animals. 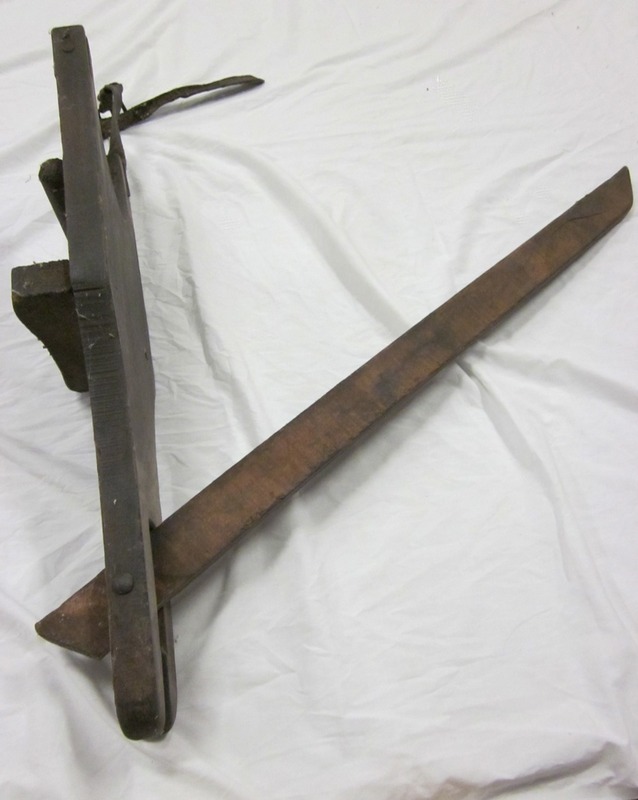 Before farmers had good fencing, they used pokes or checks to stop cows, sheep and horses from getting through a fence or field row. Inside a barn, cows were chained to a post or had their head placed through a stanchion. A cow bell was not a restraint, but rather a way for a farmer to find where a cow had got to.